volunteer? let us know if you would like to help run a tennis camp like those described below. we need you! No special requirements - only a love of children and a passion for the game! We'll contract with a certified tennis pro or coach! The Camps and Academies are appropriate for boys and girls 9-15 years old, who can maintain a rally over the net. If you have a group of 6-12 interested kids, ages 9-15, with intermediate/advanced skills, we can arrange an academy as described below. For the committed player who can play full court matches! GOOD PRACTICE FOR JV OR VARSITY PLAYERS! When it gets REALLY hot, we do drills in the pool! 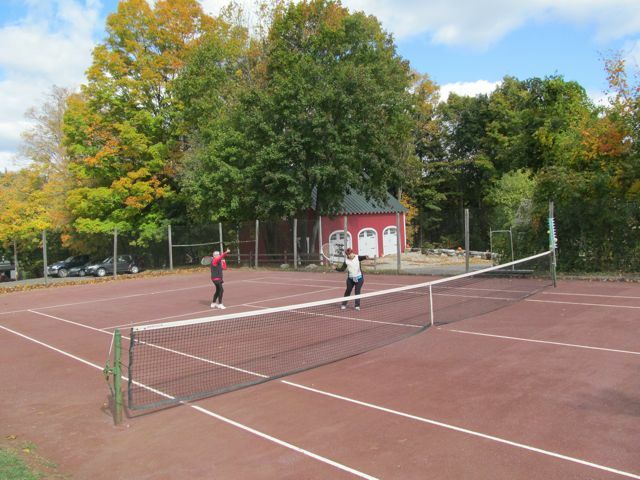 Afternoons on the red clay courts!